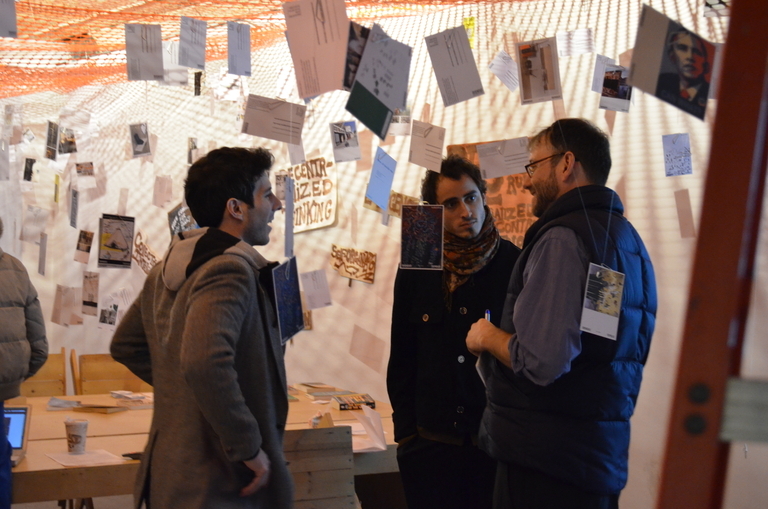 As part of the exhibition, Strategies for Public Occupation, performances, events and workshops were led by members of the art, architecture and design community, by lawyers and experts in different fields including engineering and social sciences and members of the community interested in offering different degrees of expertise. Storefront welcomed all to participate. 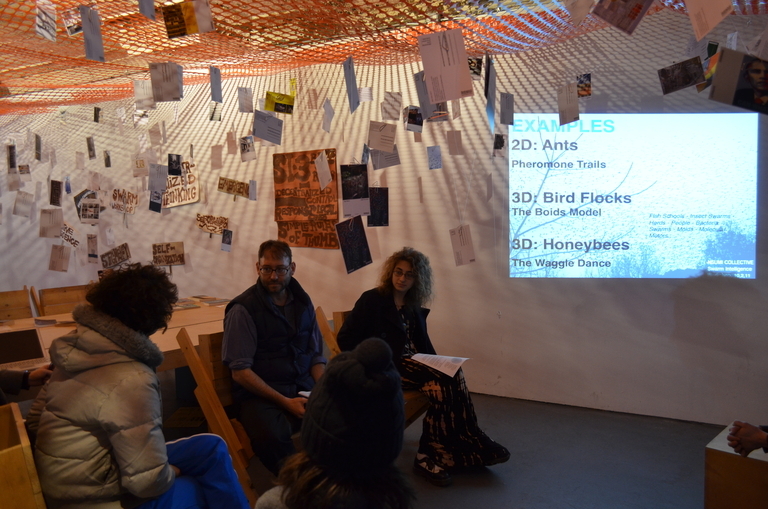 The exhibition, understood as a space of confluence and flow, served as a space for gathering, conversations and informal discussions that was broadcasted live during events, performances and discussions. 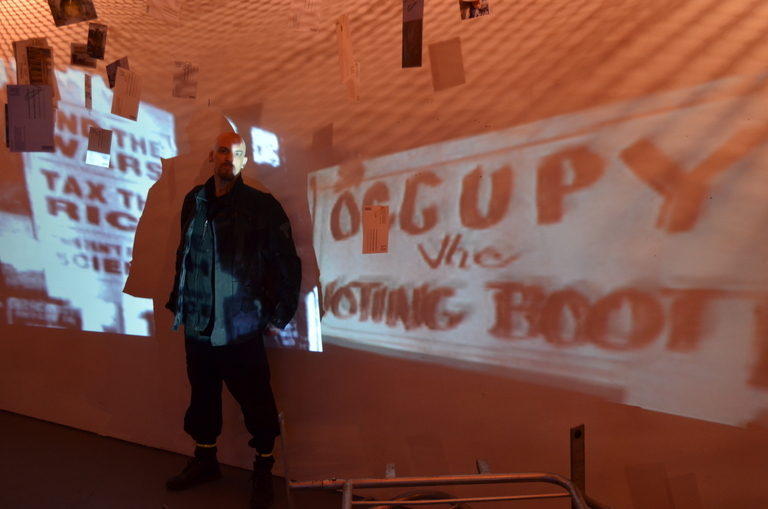 A series of Manifestos, performances and calls for action were delivered at the opening reception, showcasing a diverse array of voices and practices that addressed the question of Public Occupation from multiple varied viewpoints. Presenters included: Caroline Smith | Erin Ota, Aniket Shahane|Christopher Yost, Alexandra Lerman, Chat Travieso, Peter Macapia, Arsenio Garcia | Przemek Godycki, Forrest Jessee, and Benedict Clouette in a call for Action; Mitch McEwen presenting an Architect’s Statement in Support of the Occupy Movement; and Michael Sorkin. DSN Radio’s podcast featuring audio from the opening. 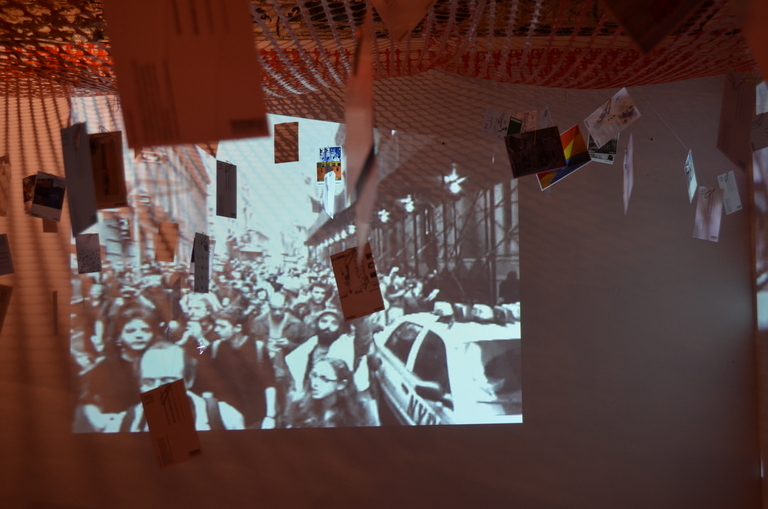 Throughout the day visitors were informed and directed to different spaces in the city which were considered to be developing ideas in relation to the Occupy movement or engaging with some of the actions happening within and around the gallery space. Parade of Protests: Visitors were able to participate in an individual performance by grasping some of the signs created by Alexandra Lerman and performing an individual action around the neighborhood. 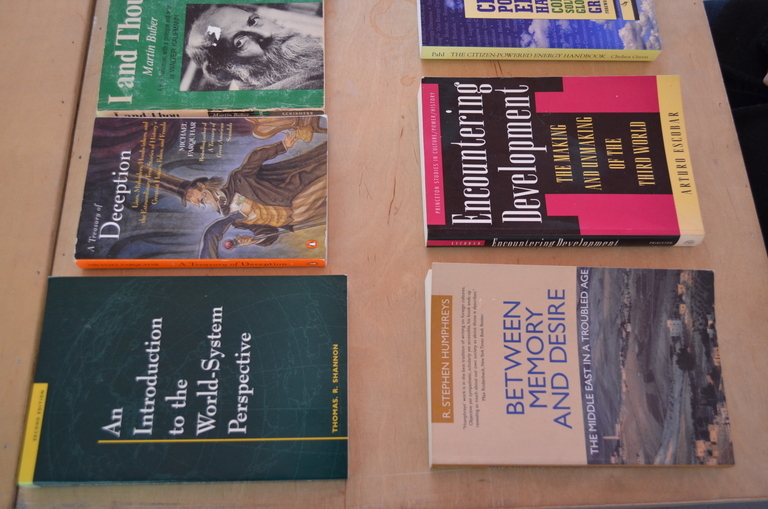 International Public Space Library (IPSL): presented by MomenTech, IPSL was a temporary pop-up branch of the International Public Space Library which, through the sharing of books, offered a way of helping stimulate public discussion of economics, politics, society and culture in relation to the Occupy Wall Street movement and other social movements powered by the free exchange of ideas. 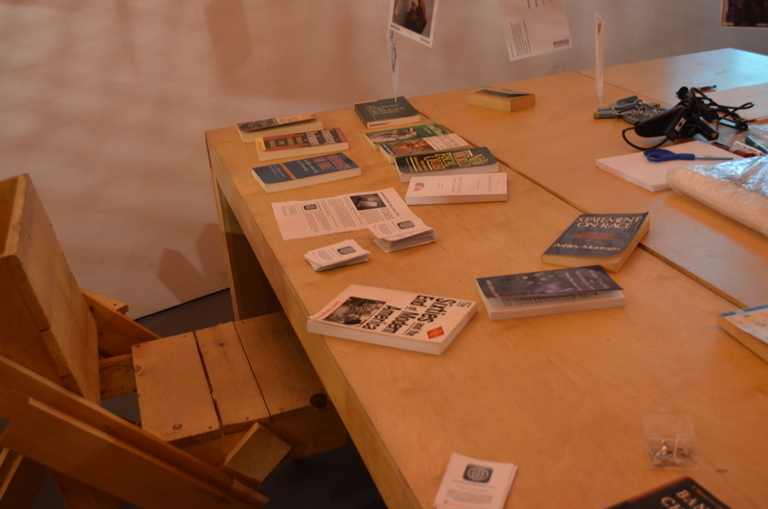 Visitors were encouraged to borrow a book and upon completing it, place it somewhere in the public space for others to find. 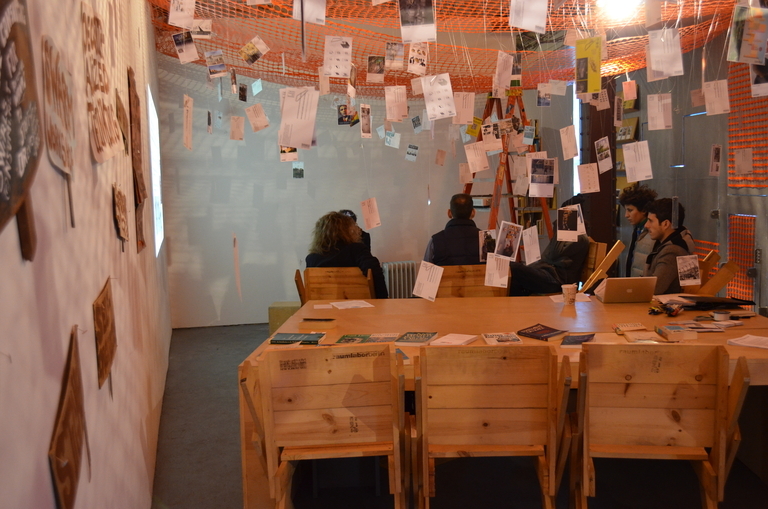 Visitors were also given free IPSL Ex Libris, which they were then able to attach to their own books to leave either at the temporary IPSL branch at Storefront, or in any public space of their choosing. 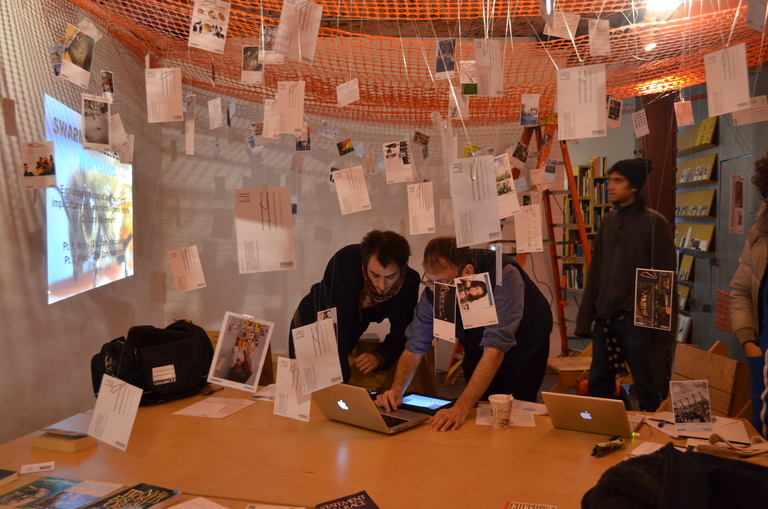 On The Question of #whOWNSpace: #whOWNSpace is a collaborative effort that arises from the questions that the #occupywallstreet movement has brought up about ownership and use of open space in New York City, North America, and cities around the world. 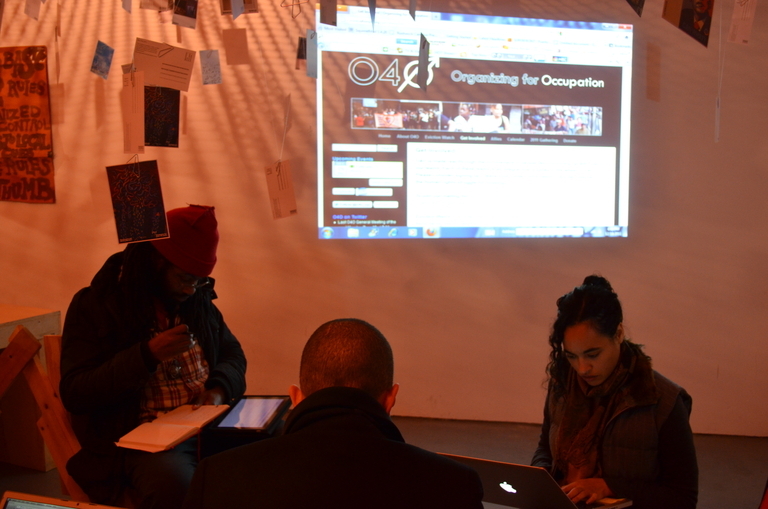 Occupy your home transforming it into a public space. To understand the possibility of action one needs to be able to delimit the margins of the possible. 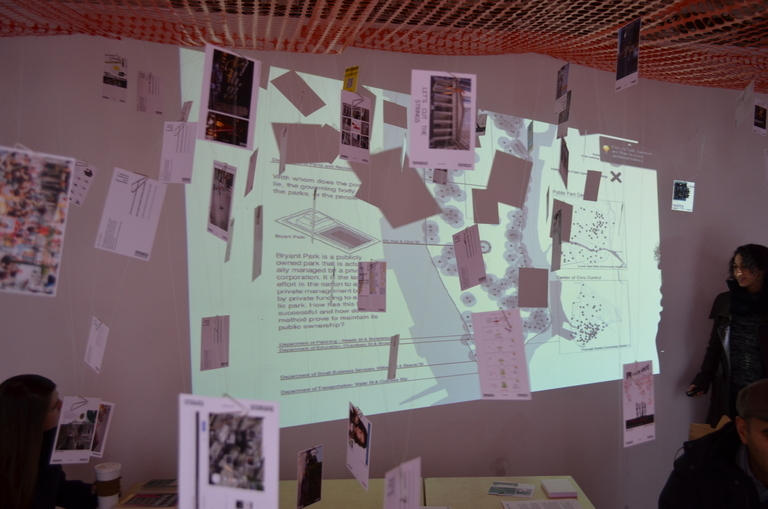 Laws and maps are two of the most relevant documents that guide and constrain the possibilities of action. This day unveiled and produced laws that allowed citizens to empower actions beyond inherited parameters. 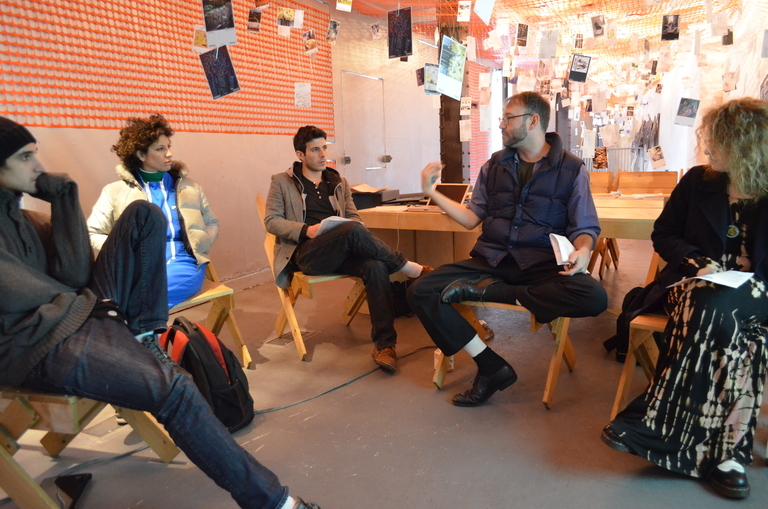 Throughout the day Storefront coordinated a series of talks with individuals from the Architecture group OWS, including artist Francisca Benitez and cyberneticianSuperglitch, among others. 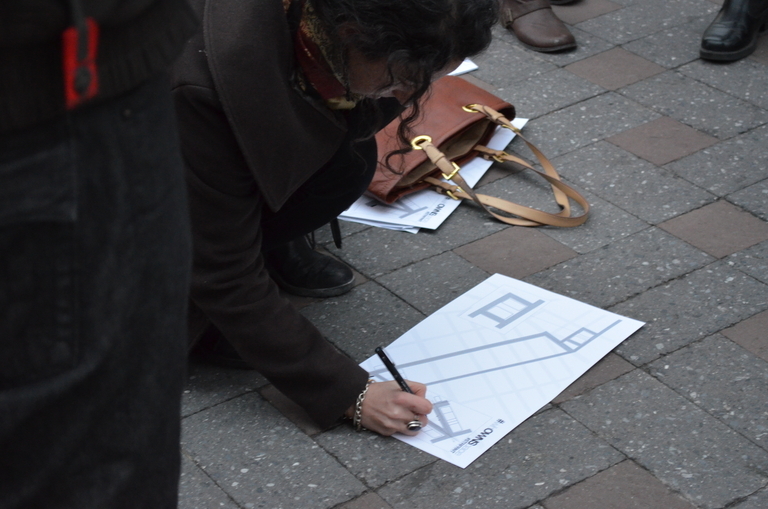 WHOWNSPACE showed their work in regard to the POPS [privately owned public spaces] and lead a workshop on the use of design and urban theory to critically study the design, ownership, and rules of New York City’s open spaces as part of the #whOWNSpace project. 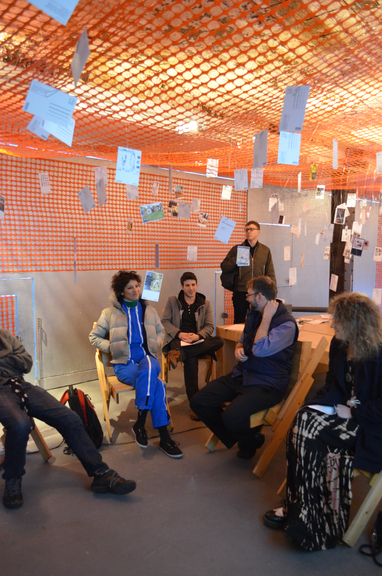 The lens for the workshop will be on power dynamics around public space, focusing on the potential of open space to create democratic vitality. 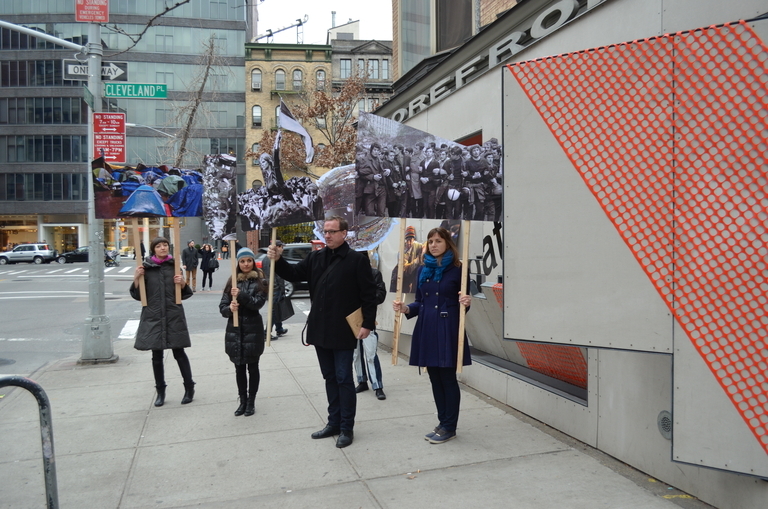 With: DSGN AGNC – Rena Mande, Amanda Rekemeyer, Phil Grimaldi. 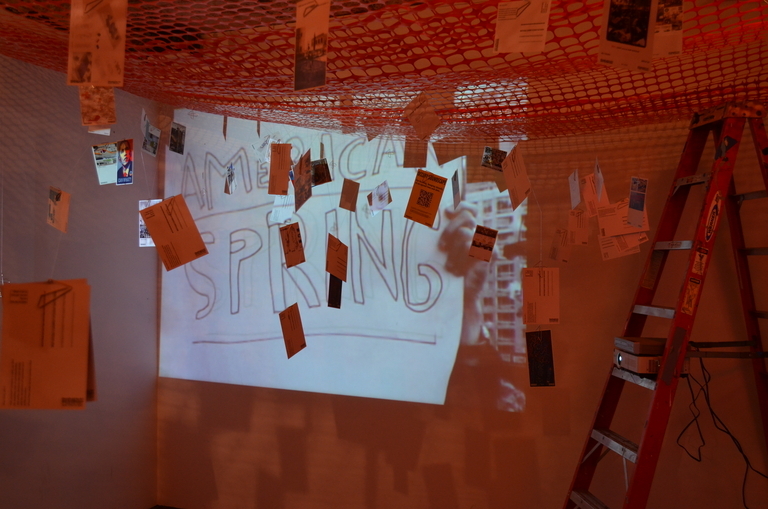 Organized by Quilian Riano. If architecture can find inspiration from science fiction, perhaps it can participate in the formation of legal or political fiction. 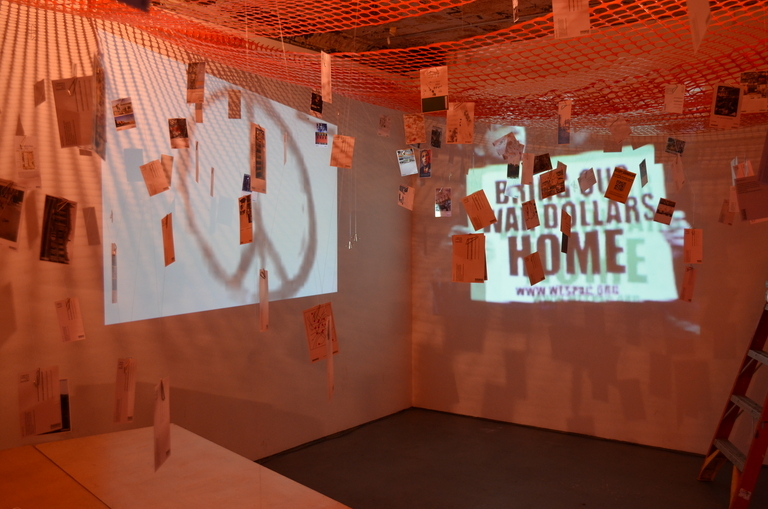 This was a workshop to craft such a legal and architectural fiction into a manual for occupation: “How to occupy a home in America.” From 4pm-6pm participants at Storefront shared tactics, including drawings and images, for a step by step occupation of “home.” From 6pm-7pm the workshop focused on the production of this manual for public dissemination. 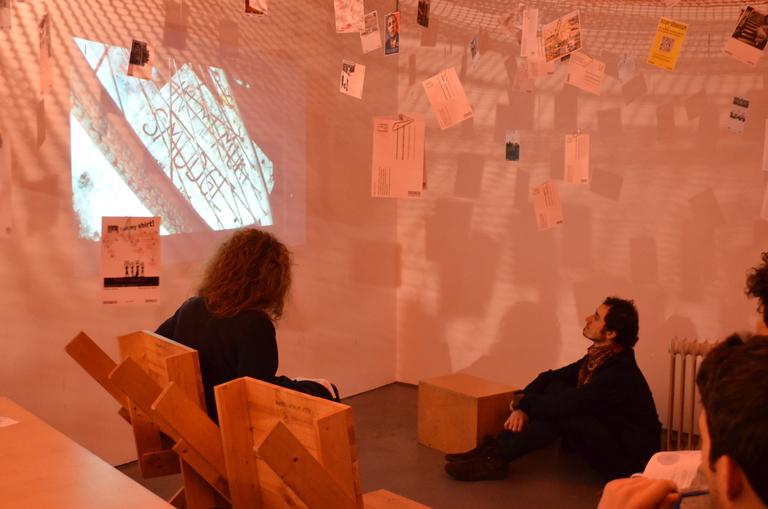 Participants were encouraged to bring a laptop and/or drawings, original images, and drawing implements. Organized by Mitch McEwen. 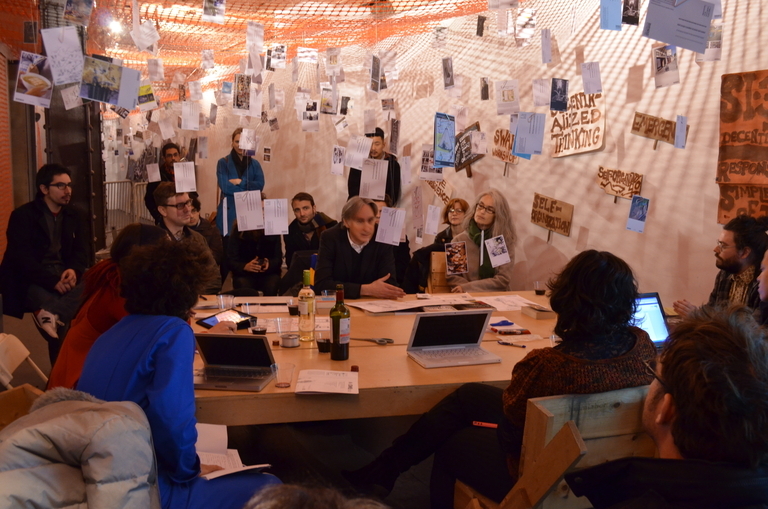 Reinhold Martin, Yates McKee, Paula Segal and a group of artists and architects explored the different approaches to the legalities of spaces and the possibilities of action. 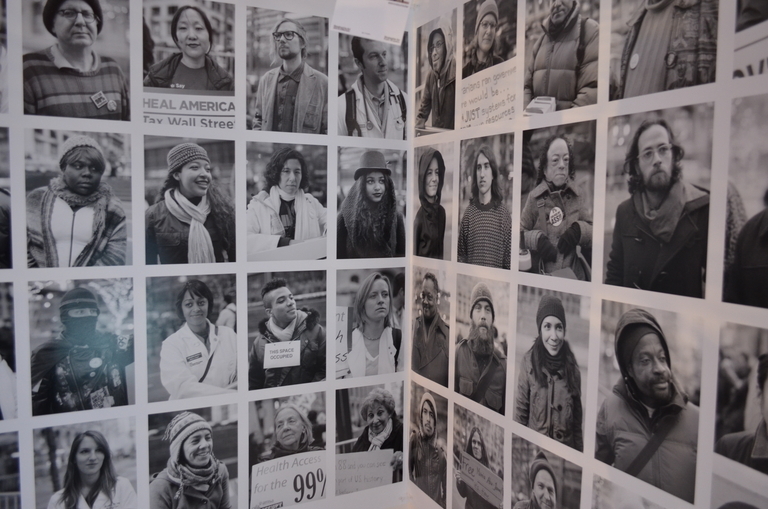 On this day, the exhibition showcased projections, posters and protester signs, and Storefront hosted conversations and workshops about how different mediums and design strategies have been used as messages to communicate different strategies of protest. 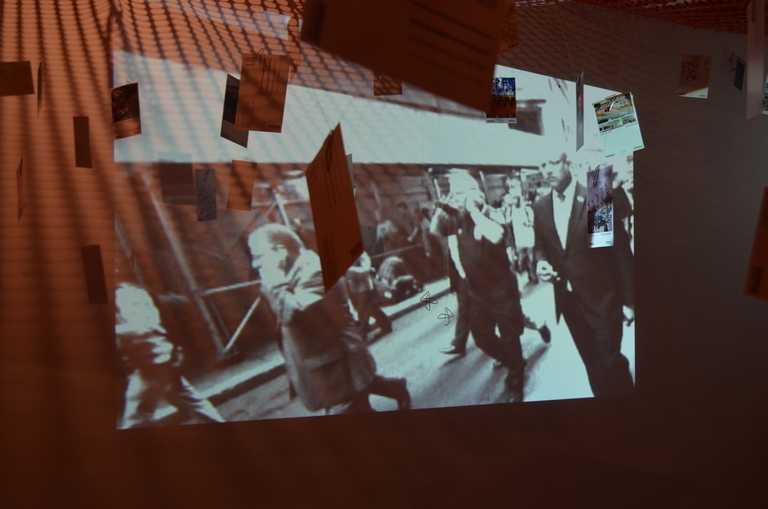 From the camps and structures created in the various cities’ occupy sites to the very architectures on Wall Street that symbolically embody the existing societal structures that have inspired the movements, architecture is an enabling and constitutive force. 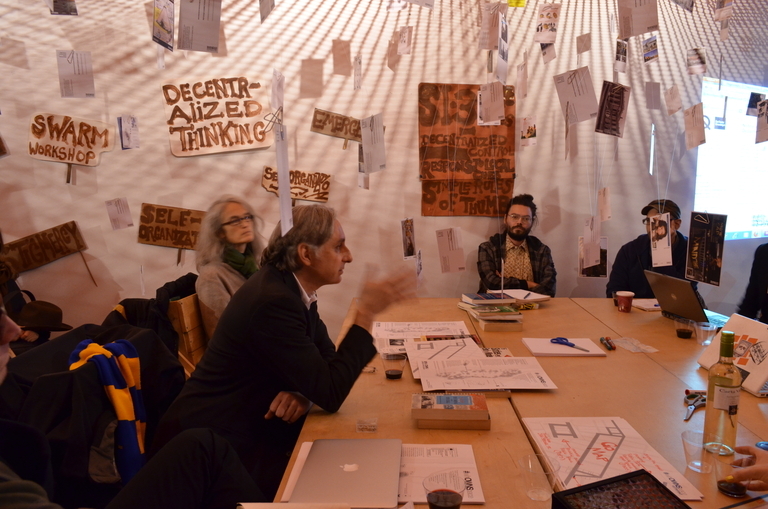 This day was dedicated to discussing the role of architecture and urban design while envisioning a world order that differs from existing canonical forms of in-habitation. 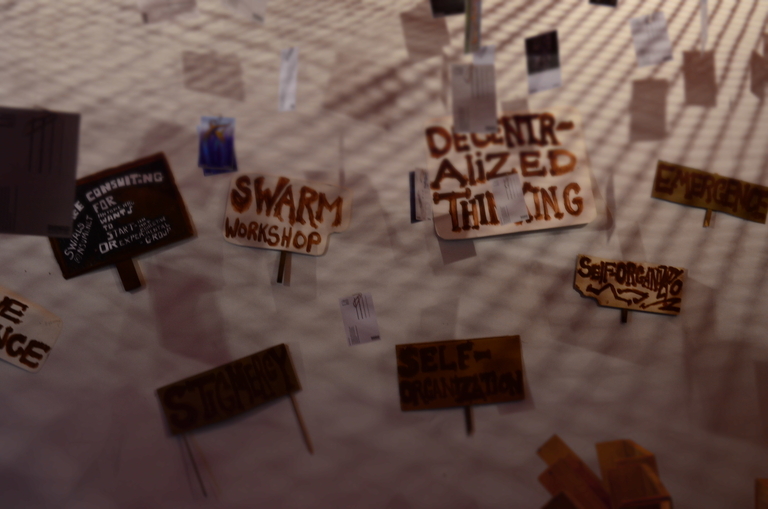 A workshop exploring the spatial and structural implications of Swarm Intelligence for the Occupy Movement. BySuperglitch. 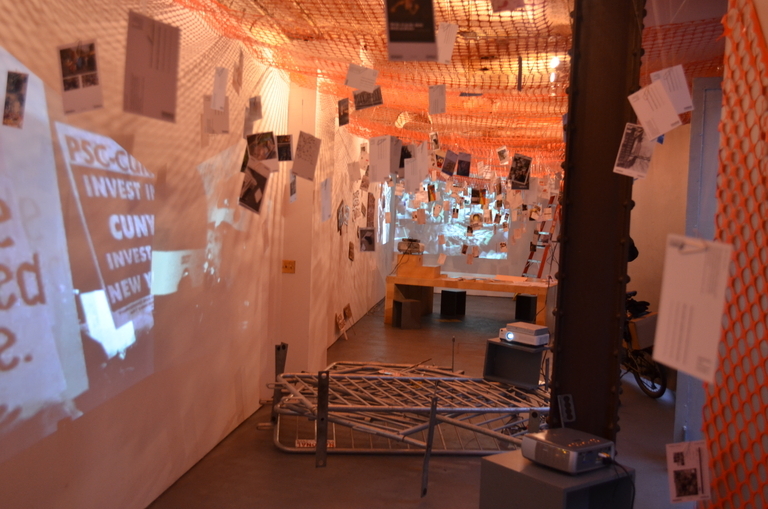 Although statements of solidarity and non-violence can be heard at most General Assemblies and Occupations across the country, the urban and architectural typologies found within the largest Occupy camps defaulted into normalized zones of exclusion and segregation [ie:the gated community]. 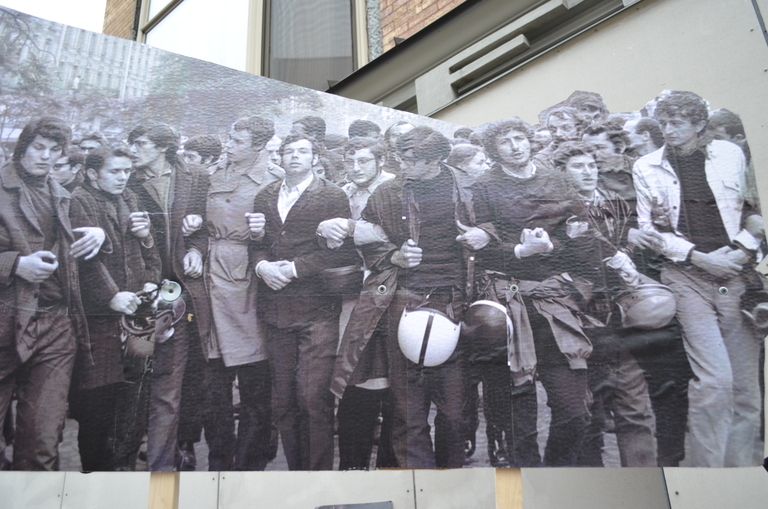 Why, when it came to urbanism, and architecture, did even the most ‘radical’ revolutionaries immediately default into the typologies most directly connected to/embedded in the system they were trying to overcome? 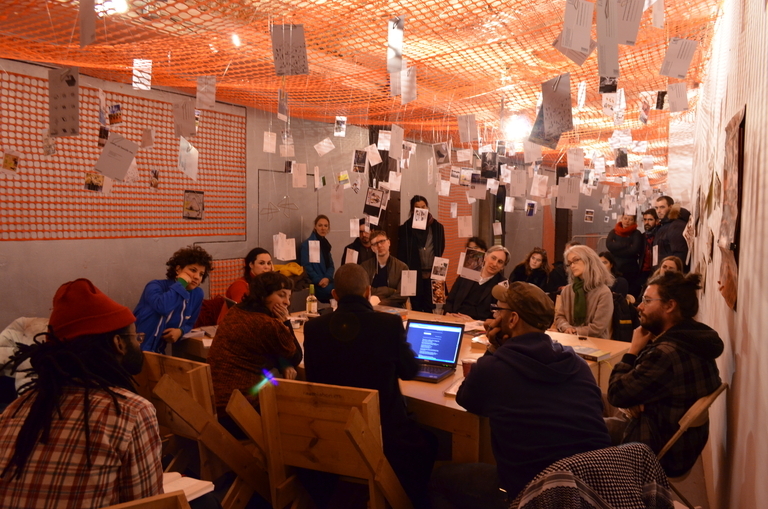 We discussed the typologies of urbanism and architecture found within the occupyLA camp, how they ended up the way they did, how these architectures affected [often negatively] the camp/community structure, and speculated on what other alternatives could have been. 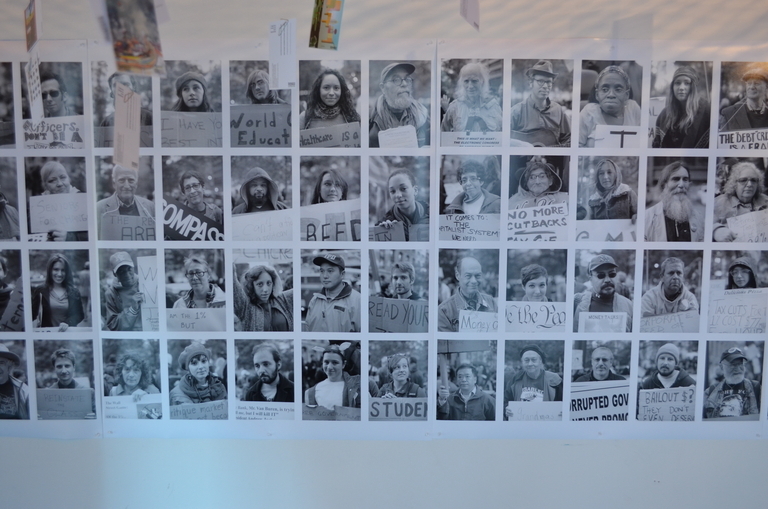 Occupy is a series of portraits of the diverse personalities who view Zuccotti Park and related OWS actions as a fertile ground for voicing their discontents and organizing to effect change. 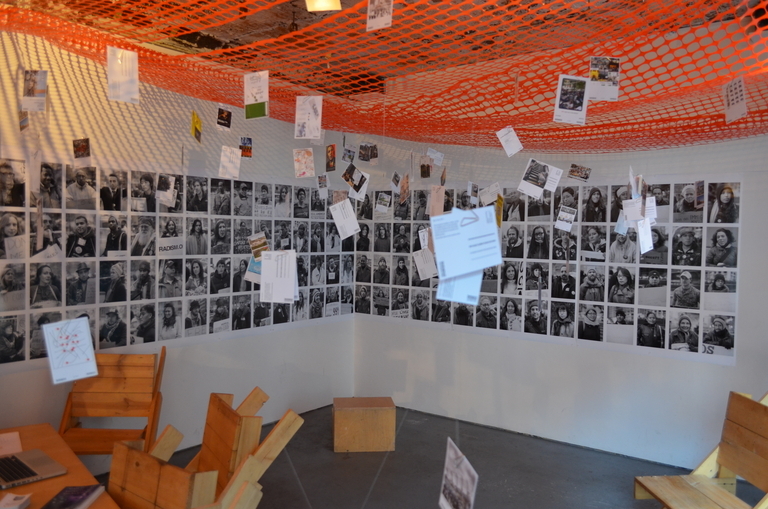 The 400 images in the installation are arranged in chronological order, spanning October 2nd to December 18th. 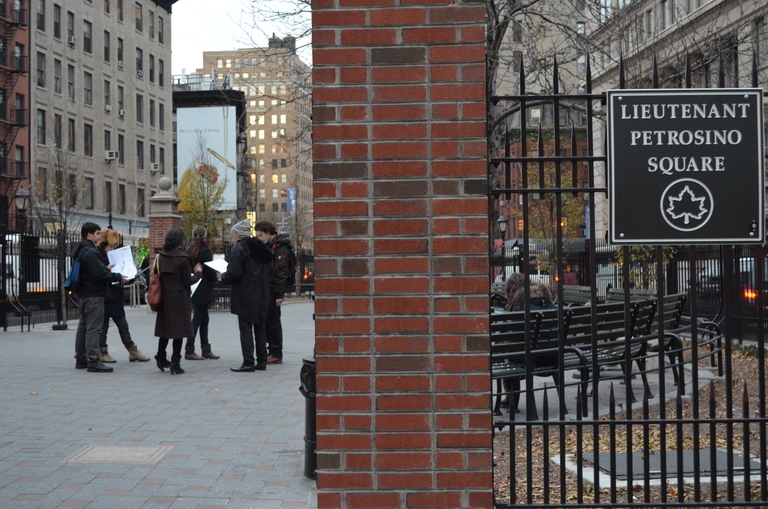 Many of the protesters and activists pictured were a constant presence in the park during this time. 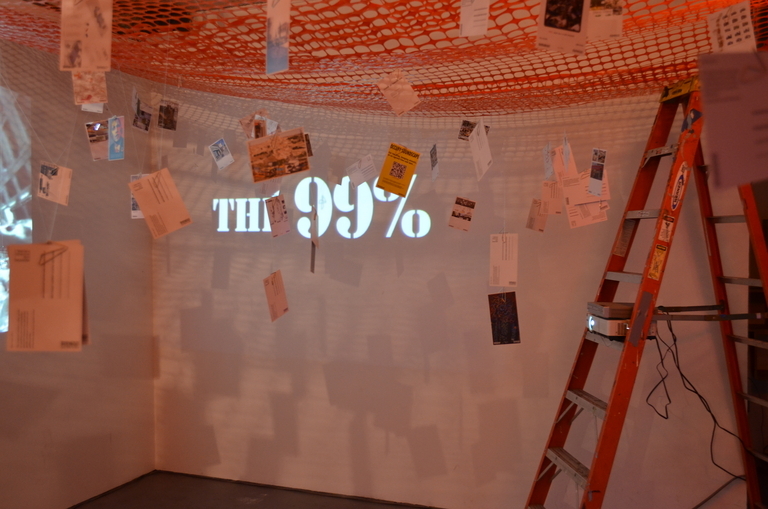 Others came from far afield to sample New York City’s brand of direct democracy, in order to spread that model to their homes. 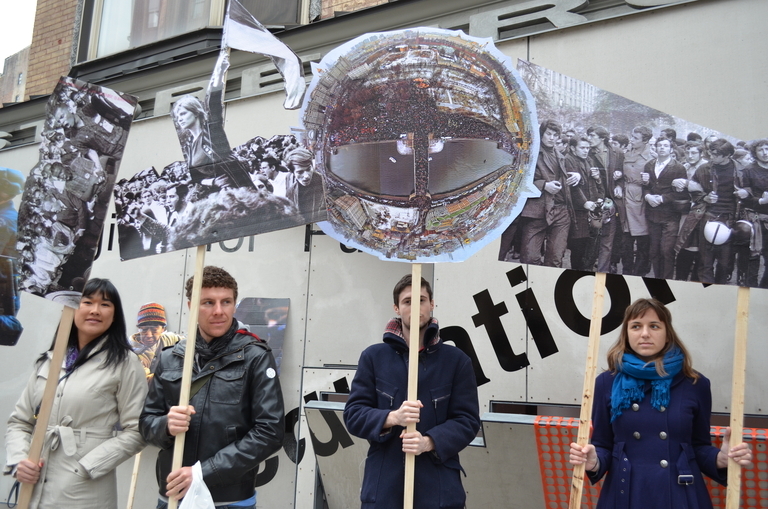 All carried potent messages with them. 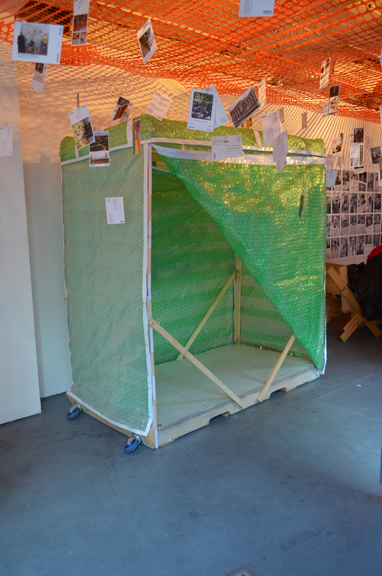 On the last day of the exhibition, Storefront housed a series of real scale prototypes that functioned as strategies for urban occupation. 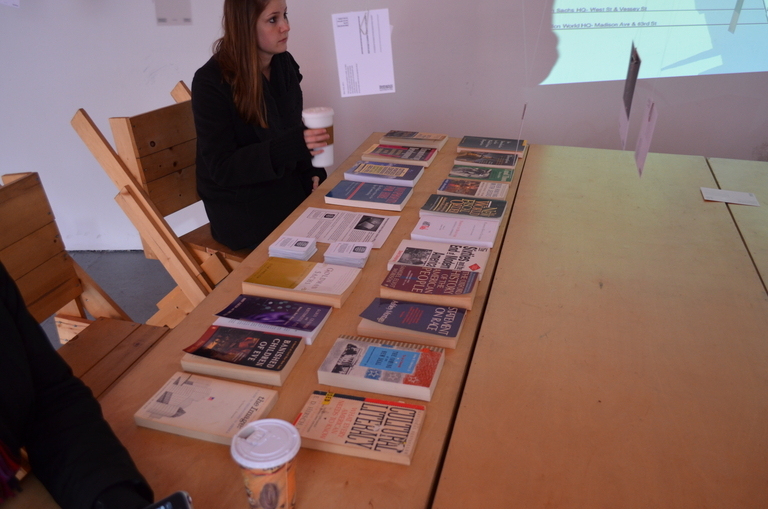 From shelters, to posters, to chairs for urbanity, to occupy holiday postcards, to do it yourself manuals, visitors to the gallery were able to take these presented objects as presents. 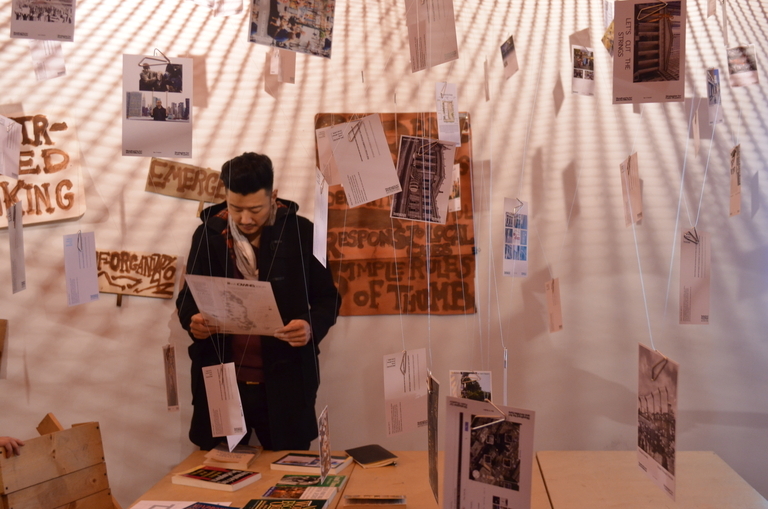 Works to take away included urban occupation prototypes and sheltering from members of the OWS Architecture working group including Greta Hansen, Kyung-Jae Kim, Adam Koogler, Andy Rauchut, Marcos Zotes, Jenny Polak, Mitch McEwen, Stanislava Odrljin, Francisca Benitez, and Forrest Jesse. 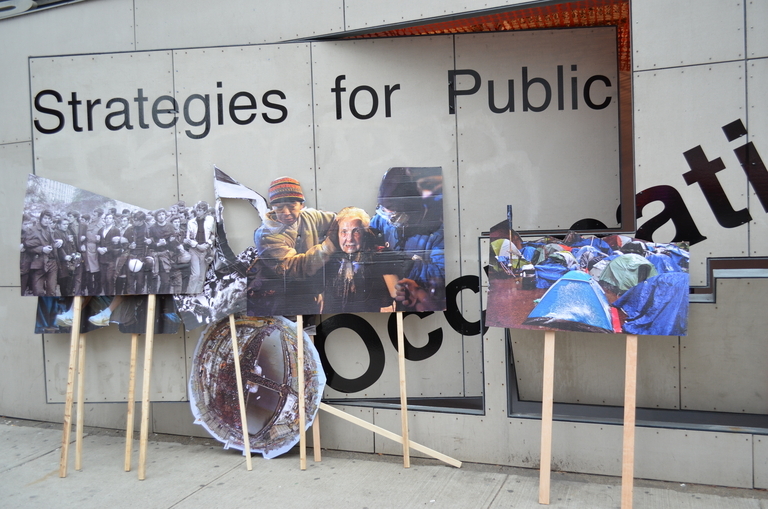 Strategies for Public Occupation: Day 1 Manifestoes from Storefront for Art&Architecture on Vimeo. 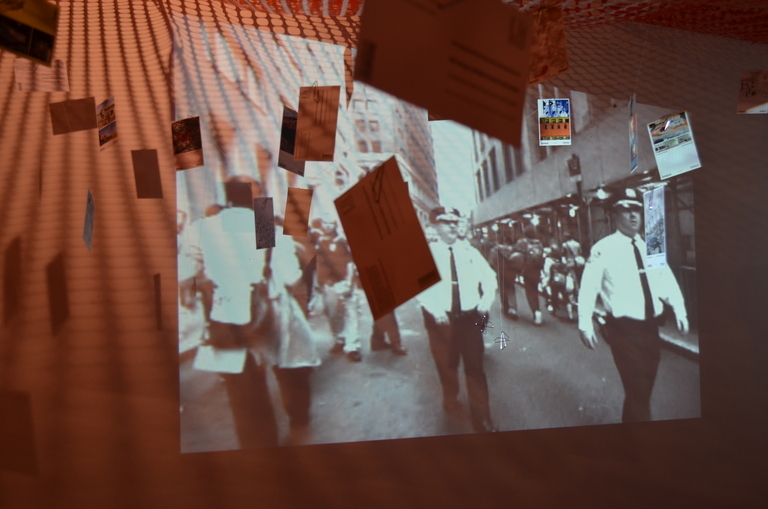 Day 2 Urban Action from Storefront for Art&Architecture on Vimeo.